Risks of Megadose Vitamins: More Harm Than Good? As we’re getting deeper into fall and starting to get hints of the arrival of winter, many people are stocking up on vitamins to fight off winter illnesses. It may seem safe and natural, but could you be doing yourself more harm than good when supplementing with vitamins? There’s a very good chance you could be if you’re making certain choices. I’m here to tell you how, and to expose the hidden dangers of megadose vitamins. Megadose Vitamins: Doing You Harm? I don’t want to scare you, but it’s quite possible the “megadose” bottles of vitamin C, D, and E you see on store shelves could lead to cancer, cardiovascular disease, not to mention a waste of your hard-earned cash. Look, no one is going to blame you for thinking that natural means safe, and that getting more of something natural ultimately seems better. It’s completely intuitive. Let me put it this way: do you think it’s a good idea to sit down and eat seven or eight whole cantaloupes? Probably not. But that’s exactly how many you’d have to eat to get the same amount of vitamin C contained in a single 1,000-milligram (mg) megadose tablet of vitamin C.
The daily recommended dose for vitamin C is actually 75-120 mg, and although taking up to 2,000 mg can be safe, it is not recommended, especially because doing so consistently can result in side effects like an upset stomach and diarrhea. And more of the vitamin doesn’t necessarily mean more benefits: people who take vitamin C to prevent colds don’t get them any less frequently than those who don’t, and using it as a treatment won’t have any impact on symptoms. Another popular antioxidant supplement is vitamin E. Most people only need about 20 mg of vitamin E per day, which can be attained by eating about 30 almonds. 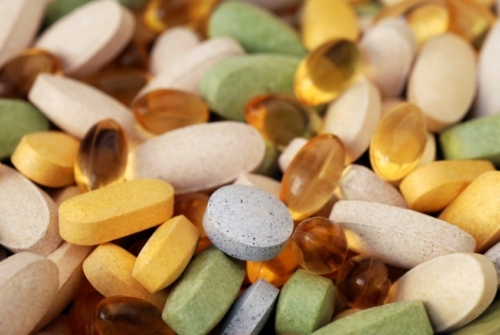 Supplement dosages are often 50 times that amount…and it’s totally useless! Furthermore, there is research showing that taking too much vitamin E can increase a man’s chances of getting prostate cancer or a smoker’s risk of lung cancer! And it’s a similar story for people taking vitamin A (beta-carotene) supplements. Research shows smokers who take vitamin A supplements have a greater risk of lung cancer than those who don’t. One of the most common winter-time supplements—especially for people in colder, darker climates—is vitamin D. But guess what? There is virtually no evidence to suggest that taking more vitamin D than recommended is more beneficial than taking the daily recommended amount. And get this: one study even shows that people with low vitamin D levels are just as likely to experience cardiovascular disease as those with really high blood levels! I would like to emphasize that in some cases taking high amounts of vitamin D is recommended. For example, a friend of mine was instructed to take 10,000 International Units (IU) per day for a set period in order to bring her levels up. But this was an instruction from her doctor and she was warned to only do it for a limited time. Typical recommendations for vitamin D intake are generally in the 600 IU per day range, with the upper limit being around 4,000 IU a day. If you take 4,000 IU or more per day for an extended period, you can run into all kinds of complications like kidney stones, high blood calcium, arterial calcium deposits, and calcification in soft tissue like muscles, organs, tendons, ligaments and other areas. The moral of the story here is that natural is not synonymous with safe, nor is more necessarily better. You need to know about the risks of megadose vitamins before you blindly buy into their benefits. And I’m going to tell you something you’ve probably heard a million times before, but it’s always worth repeating: a healthy, balanced diet is the best way to get all the nutrition you need. You can’t overdose on vitamins or experience vitamin toxicity when you get your nutrients through food. And for vitamin D, which isn’t as easy to get through diet, I try to get 20-40 minutes of sun per day (harder in the winter months, of course!). If that’s too difficult, then take a supplement at a healthy range. Being smart about supplements can save your health and money! “Megadoses of popular vitamins may do more harm than good, experts warn,” CBC News web site, last updated November 13, 2015; http://www.cbc.ca/news/health/megadoses-vitamins-more-harm-than-good-1.3317534?cmp=rss. “Vitamin C,” National Institutes of Health web site, February 2, 2015; https://www.nlm.nih.gov/medlineplus/ency/article/002404.htm. “Selenium and Vitamin E Cancer Prevention Trial (SELECT) Questions and Answers,” National Institutes of Health web site, July 7, 2015; http://www.cancer.gov/types/prostate/research/select-trial-results-qa. Al Mheid, I., et al., “Vitamin D and cardiovascular disease: is the evidence solid?” European Heart Journal, published online June 10, 2013; doi: http://dx.doi.org/10.1093/eurheartj/eht166 eht166.